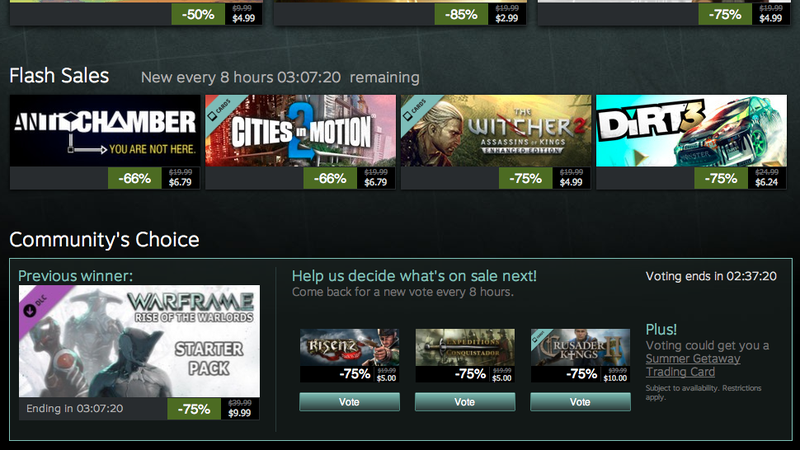 The Steam Summer Sale is without a doubt the year's most well-known series of discounts on games, but at Kotaku we know you want gaming deals every day. Brought to you by the Commerce Team, the Kotaku Moneysaver posts every day at 2:15pm ET*, bringing you the best, most complete, and easiest to consume coverage around on video games and related products. We cover all the retailers, all the services, and all the accessories. Check it out. *We're currently posting at 5pm ET during the Steam Summer sale. Here's the current regular Moneysaver. The Moneysaver: Rayman Legends, Donkey Kong, The Last Guardian? Chronicle of a deal foretold. Crusader Kings is the best of the voting bunch. • Flash Sale Cities in Motion 2 ($7) I thought this was a triple repeat but it turns out those were other random city sims. Price is fine. • Flash Sale Dirt 3 ($6) | Whole series has been bundled for pretty cheap before. Price is good. My advice is every time you want to play a new racing game, just play Burnout Paradise again instead. • Flash Sale Witcher 2 Enhanced ($5) | Repeat, has been this price many many times. Still an awesome deal. Let's see... we've got a 59/100, 66/100, and 69/100 for our voting options. I'm going to close my eyes and click. • Community Sale Bastion ($2.24) | Repeat, great deal. • Flash Sale FEZ ($5) | Repeat, great deal. • Flash Sale RAGE ($5) | The only non-repeat in this update, RAGE has been this price several times in the past. Good price, polarizing game. A lot of people loved it, I got bored playing it very quickly. • Community Deal Walking Dead ($6.24) | The second best non-Humble price ever on it. Still a great deal, and a repeat. • Flash Sale Gunpoint ($6) | Probably the most anticipated deal of the whole sale, jump on it. • Flash Sale Left 4 Dead 2 ($5) | Triple repeat. • Flash Sale LEGO Lord of the Rings ($7.50) | Wait for a LEGO games bundle instead. • Flash Sale War of the Roses: Kingmaker ($5) | Fine price, medium reviews, haven't played it. • Grand Theft Auto IV ($5) | Can we just put a moratorium on GTA4 deals? Don't buy it unless it's bundled with the DLC, and it is, constantly. • Dead Island ($20) | Thought this was a repeat but I think it was actually a failed vote. Either way, no. • Fallen Enchantress ($14) | If nothing else this sale has really opened me up to a whole lot of medium review score strategy games I know nothing about. This expansion does not require the original game. Chime in if you've played it. • Tropico 4 Steam Edition ($6) | Repeat. Also, I think this has probably been on sale every day since I started this job. • Ace of Spades ($2.50) | In 13 reviews the highest score it got was a 63/100. • Mount and Blade: With Fire and Sword ($2.50) | Yay again for generic titles. Middling game, if you like it you might want to buy the collection for $8.50 instead.